"This Handbook is a classic. It helps connect the research of academia to the practical realities of peacemaking and peacebuilding like no other. It is both comprehensive and deeply informed on topics vital to the field likepower, gender, cooperation, emotion, and trust. It now sits prominently on my bookshelf." "The Handbook of Conflict Resolution offers an astonishing array of insightful articles on theory and practice by leading scholars and practitioners. Students, professors, and professionals alike can learn a great deal from studying this Handbook." "Morton Deutsch, Peter Coleman, and Eric Marcus put together a Handbook that will be helpful to many. I hope the book will reach well beyond North America to contribute to the growing worldwide interest in the constructive resolution of conflict. This book offers instructive ways to make this commitment a reality." "Let's be honest. This book is just too big to carry around in your hand. 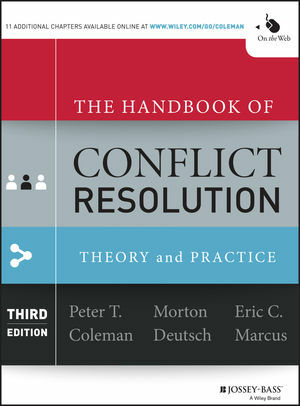 But that's because it is loaded with the most critical essays linking the theory and practice of conflict resolution. The Handbook of Conflict Resolution is heavy on content and should be a well-referenced resource on the desk of every mediatoras it is on mine." Peter Coleman is Associate Professor of Psychology and Education at Teachers College, Associate Professor of Psychology at The Earth Institute at Columbia University, current Director of Int'l Center for Cooperation and Conflict Resolution at Teacher's College, Faculty Sponsor of the MS Program in Negotiation and Conflict Resolution in Dept of Continuing Ed at Columbia, and?an active mediator. Morton Deutsch is the E.L. Thorndike Professor and director emeritus of the International Center for Cooperation and Conflict Resolution (ICCCR) at Columbia University. He is considered to be one of the leading pioneers in the study of intergroup relations and conflict resolution. Eric Marcus is Founder and Principal of The Marcus Group, a consulting firm that specializes in enhancing organizational effectiveness and individual and group development, whose clients include: JPMorgan Chase, United Nations, Neighborhood Housing Services of NYC and Say Yes to Education. He also teaches in the Master's program in Negotiation & Conflict Resolution at Columbia University. Chapters 46 through 56 are available exclusively as online downloads. Visit www.wiley.com/go/coleman for more information.